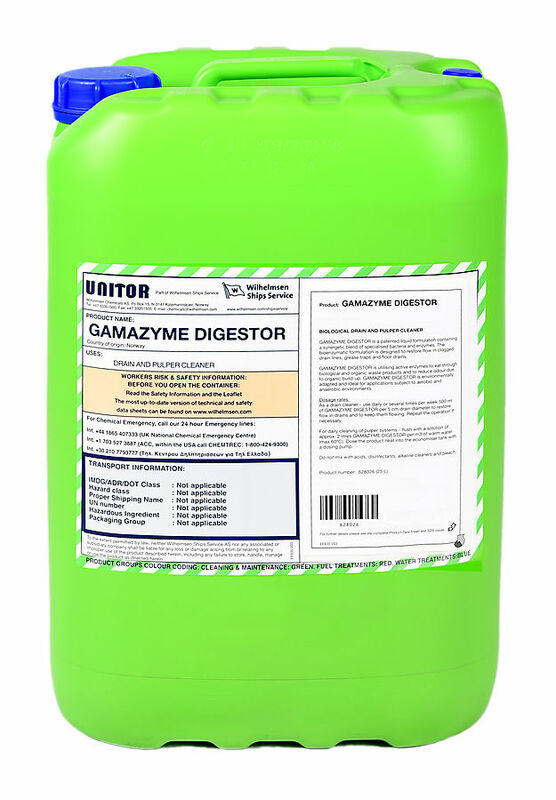 Utilising active enzymes to eat through biological and organic waste products, Unitor™ Gamazyme™ Digestor is a safe and non-corrosive product used to restore flow in drains where grease accumulation is a problem. Unitor™ Gamazyme™ Digestor’s biochemical formulation is designed to provide exceptional performance in clogged drain lines, grease traps and floor drains. It restores slow running drains and reduces odours due to organic build-up. Use 500ml of Unitor™ Gamazyme™ Digestor per 5cm drain diameter to restore flow in drains and to keep them free flowing. Repeat the operation if necessary. Use regularly, once a day or several times a week to maintain drains free of grease. Flush the whole system at the end of the day including pulpers, pipes, etc. with warm water (maximum 60°C) and Unitor™ Gamazyme™ Digestor. Dose the product neat in the economiser tank by using a dosing pump. Use a dosage rate of approximately 2 litre per m3 water.